People vote at a polling station during the presidential election in Tbilisi, Georgia, Oct. 28, 2018. Georgia's presidential election will go to a runoff after French-born former Foreign Minister Salome Zurabishvili won the first round by a razor-thin margin but failed to muster enough votes to avoid a showdown against her closest rival. Salome Zurabishvili, former Georgian Foreign minister and presidential candidate, speaks to the media at a polling station during the presidential election at the polling station in Tbilisi, Georgia, Oct. 28, 2018. Grigol Vashadze, Georgia's former foreign minister and presidential candidate, center, gestures while speaking to journalists at his headquarters during the presidential election in Tbilisi, Georgia, Oct. 28, 2018. With no candidate winning 50 percent of the vote, parliament speaker Irakli Kobakhidze told a news conference that a runoff will be required. Former parliament speaker Davit Bakradze, who was nominated by the opposition European Georgia party, was a distant third with 10.9 percent. Bakradze said his party will throw its support behind Vashadze in the runoff. CEC head Tamar Zhvania said the final results of the first round will be published within 20 days, and the runoff on a Sunday within two weeks after that. "Therefore, the deadline for the runoff is December 2," Zhvania said. Turnout stood at 46.7 percent, according to the CEC, nearly the same as in the last presidential election in the South Caucasus nation, in 2013. The presidential election, Georgia's seventh since 1991, is the the last in which the head of state is to be elected by direct ballot. A record 25 candidates registered for the poll. In 2017, the constitution was amended so that future presidents would be elected by a 300-member College of Electors, comprising parliamentarians and local and regional political representatives. 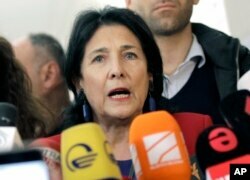 Zurabishvili has the backing of the ruling Georgian Dream party as she seeks to become Georgia’s first female president. The post is less powerful than that of prime minister in the country of roughly 5 million. Vashadze, also an ex-foreign minister, is running for the opposition United National Movement (UNM), once led by former President Mikheil Saakashvili, who is in exile. Prime Minister Mamuka Bakhtadze congratulated Georgians after polls closed, saying the vote was held in a "peaceful, free, and democratic environment." "We are serving all the nation," said outgoing President Giorgi Margvelashvili, who is not seeking a second term, after casting his ballot. Some 3.5 million were eligible to cast ballots in the election, which was monitored by observers from the Organization for Security and Cooperation in Europe (OSCE). Transparency International Georgia said its observers had reported “up to 90" violations ranging from "insignificant" to "relatively serious," and ones that included alleged vote-rigging and vote-buying. Zurabishvili, 66, is running as an independent even though she has the backing of Georgian Dream, headed by former prime minister and billionaire Bidzina Ivanishvili. She has been criticized over her background and been branded a traitor by some detractors over comments they interpreted as suggesting that Georgia started the 2008 war with Russia. Zurabishvili was born in France and first traveled to Georgia when she was in her 30s. She has served as a French diplomat in the past. Vashadze says that Saakashvili, who is living in exile and has been convicted in absentia of abuse of power, should be allowed to return to Georgia. FILE - Mikheil Saakashvili, former Georgian president-turned-Ukrainian opposition leader, speaks to reporters in Warsaw, Poland, Feb. 13, 2018. Saakashvili was president from 2004 until 2013, a year after Ivanishvili's Georgian Dream defeated his UNM in parliamentary elections. Georgia is a strong U.S. ally and has expressed desires of joining NATO and the European Union. Former Imperial-era and Soviet-era master Russia backs separatists who hold the breakaway Abkhazia and South Ossetia regions, which Moscow recognized as independent states after the 2008 war.